IMPORTANT VIP UPDATE FOR STRANGE MUSIC FANS!!! 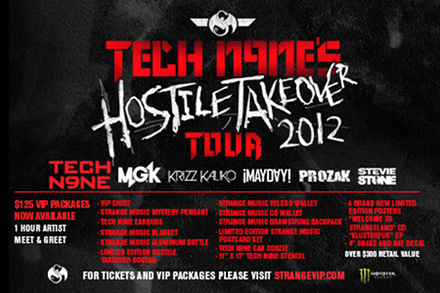 We continue to be amazed by your support of the Hostile Takeover 2012 Tour! Due to the overwhelming demand – we’ve had more people than ever before taking part in the VIP experience – we scrambled to put together a second VIP package in order to meet demand! Unfortunately, not everyone moves as fast as we do and there have been some hiccups in manufacturing – we’re working hard to get all of these items to our warehouse as quickly as possible so we can get them packed up and sent to your doors. Right now, we estimate that these new packages will begin shipping to all of you fans by 4/29. We apologize for this delay and we appreciate your understanding and patience. Please note that this doesn’t affect your ability to get into the VIP Meet & Greet or into the show you selected to attend! Thank you again for your understanding in this matter – we could’ve never guessed how amped you all were for the Hostile Takeover 2012 Tour – know that we’re doing everything we can to get all of this great merchandise into your hands as quickly as possible!